Notes: No installer - just unzip and run. There is a DirectX version and an OpenGL version. Both have same content. 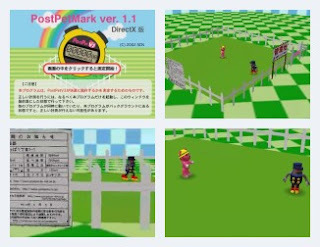 PostPetMark is the benchmark for PostPet, an graphical email program that's part Thunderbird, part Nintendogs. The benchmark shows one character on rollerblades skating around another character. Very short running time. Music is forgettable happy-go-lucky melody. No settings to tweak. Runs in a small window (400x300). Only tests your video card, if I'm reading the results correctly. Not recommended.